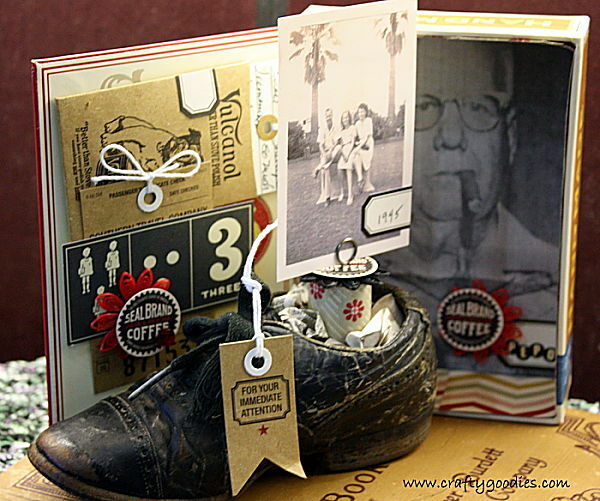 crafty goodies: Try It Tuesday~the shoe is done! The inside of the little shoe is reinforced with heavy cardboard to give me a flat surface. I used a wine cork and covered it with JBS/Magpie paper. I lined the inside of the box and inked the edges. I used Helmar Acid Free and Helmar 450 Quick Dry as my adhesive. 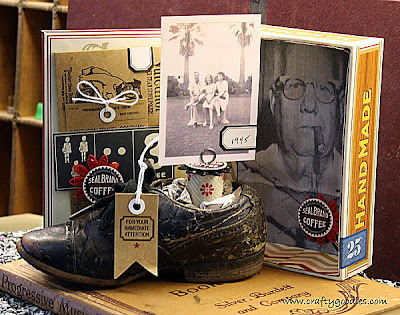 The pin is by Tim Holtz and holds the photo perfectly! I love the new Jenni Bowlin tags and they were perfect for this! I didn't photograph it~but it will all fit in the box and fold up perefct for storage. Have a great Tuesday and I will see ya soon! Reminder~Day 7 of the vintage blog series ~leave a comment for a chance to win some vintage goodies from Amanda. wow -- soooo creative. this is so cool and a wonderful tribute! Well this was definitely a quick turn around! LOL! At this point, I'm thinking you need a book deal, Connie. There is so much inspiration in everything you do. This is an amazing tribute piece. Love it! Love love love love love this Connie!!! WOW!!!! 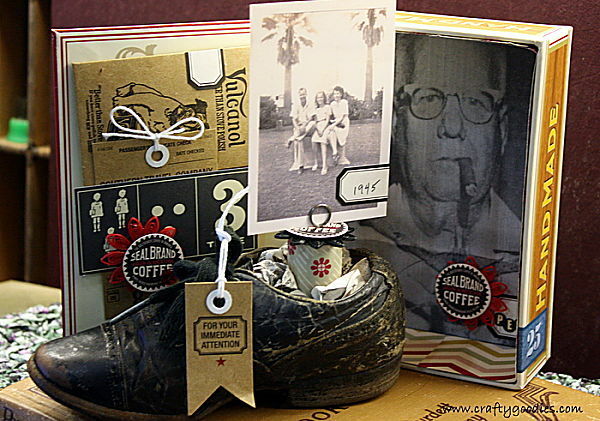 I am loving what you did with that shoe...and loving the cork too!! Very cool shrine piece! I love it! Wow! This is all kinds of awesome! So creative. Love it all. What a wonderful tribute. Very cool and awesome tribute. ooooooooo that's an awesome tribute. i love the cigar box too. hmmm...i have a few of them. some even have glass in them. Of course you would make an old show look amazing and be so special. Love this! Makes me want to create something remembering my grandpa now. So cute!! You are so creative!! LOVE it! Such a wonderful tribute to your grandfather, Connie! Love what you did with each piece. I have a packet of TH's memo pins - love them! This is amazing Connie, I have a project something like this that I am in the works of making, I just haven't found the right photo's yet. I love altering things. Love Penny P.S. I have never seen those bowls with lids before either. This is crazy great! I love it. What a neat idea! Well done! What a cool, unique project Connie! Love the vintage-y feel of the whole collection! Very clever, what a masterpiece.